Strictly speaking, nonfiction books include “How-to” books, history books, or books about any topic you wish: fashion, cars, sports figures, etc. Memoirs fit into the category of nonfiction, but in a different way because they also have many fiction elements, which the “How-to” books etc., don’t. Memoirs tell a story and therefore, require a plot, a story arc, a theme, character arcs, dialogue, a setting, all the elements of a fiction book except that the story is true. I started my writing venture years ago by writing true short stories about my ancestors, my parents, my grandchildren. I learned how to write a query letter and sent them to various magazines and received a whole lot of rejections. Then one day I received a contract and a check for $100. Then I started selling a whole lot more of my family’s stories. After that, I branched out to writing a memoir. After working in the medical field for twenty years, I turned to teaching high school science in an alternative school. My dramatic experiences in that school were like being in a movie. I started writing a memoir about those teaching days, joined a critique group, fixed my manuscript, paid $500 to a professional editor and rewrote the book. It was all worth it because I learned so much and my writing vastly improved. well-known sports figures. 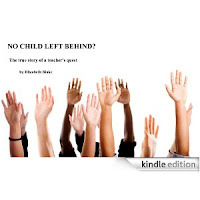 So after trying and failing to get a publisher, I self-published my teaching memoir: “No Child Left Behind? The true story of a teacher’s quest” by Elizabeth Blake. It’s in paperback and e-book form both and has done fairly well. Then I decided to try my hand at fiction and wrote a romance. My critique group taught me a lot. I read and studied “The Writers Journey” by Christopher Vogler, along with other fiction writing how-to books. In my opinion, writing fiction is a lot harder. So much to think about. Setting, characters, secondary characters, plot development, etc. All those things seemed to come naturally when I was writing my teaching memoir. I essentially wrote what happened and there was enough drama in the real-life events to carry it through, along with a natural arc in my character development. Now that I’ve written both nonfiction and fiction, I have chosen to write another memoir. This one is about my years working in the medical field—lots of interesting stories. I finished it, then had my critique group go through it and I re-wrote it. I’m currently looking for a publisher. Even though I prefer writing memoirs, I will eventually run out of interesting things in my life to write about! Then I’ll tackle another novel. And I’m sure (hope) each fiction manuscript will be easier to write.